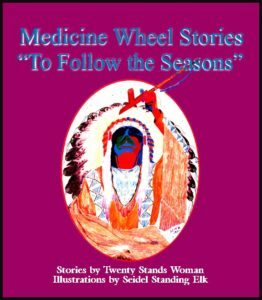 As a Native American “free thinker” in the year 2001, this book is my own interpretation of the Medicine Wheel and its use of symbolism. Symbols access the imaginary realm of our subconscious minds. They help us connect spiritually to the mystery, the center, the 5th part of our four section circle. My own experience of the thought process of Native Americans, generally speaking, has often been to note a natural tendency toward artistic and spiritual right brain function. There are some Native Americans on reservations today whose families have maintained in the traditional culture, and I want to give due recognition to these ones. But, many Native Americans today on reservations, and in urban areas alike, are out of touch with traditional values. Because there has been a lack of knowledge and of experience in age-old customs and ceremonies, one may think the old values, the old ways are being lost. I have found that the opposite is true. The values are still strong for anyone ready to receive them into their life. According to my experience as an urban Indian, this is my own interpretation of some underlying values and contributions of my Native American heritage.